Beautiful Indian Ethnic Mandala printed round table cloth will brighten up any space. It has the intricate traditional design to it which is manually printed by skilled labors. The Bright tapestry can be used in many ways like Tapestry, couch cover, yoga mat throw, Table Cloth, Picnic throw and Beach throw. Beautiful Indian Ethnic Mandala cotton tablecloth will brighten up any space. It has the intricate traditional design to it which is manually printed by skilled labors. The Bright table cover can be used in many ways like Tapestry, couch cover, yoga mat throw, Table Cloth, Picnic throw and Beach throw. Description : High-Quality Cotton Tablecloth. This is Attractive Floral Round Table Cover. Our table covers are the standard size compared to other sellers in the market. Material and print quality is the best available in the market. Go on and enjoy this beautifully created product.Rajrang is an online retails store that houses high-quality Bed sheet and accessories with strikingly exquisite designs. With its affordable rates and unique shopping experience, Rajrang is your one stop destination for making any given day an occasion. Cotton Indigo table runner measures 12"x108". Buy it for yourself or give it as a gift. This Indigo dyed table runner is perfect for those who appreciate one-of-a-kind products for their home. The fabric for this table runner was hand dyed by using traditional Japanese Shibori dyeing method, then machine finished and top-stitched in our studio. Cotton Indigo table runner measures 16"x72". Buy it for yourself or give it as a gift. This Indigo dyed table runner is perfect for those who appreciate one-of-a-kind products for their home. The fabric for this table runner was hand dyed by using traditional Japanese Shibori dyeing method, then machine finished and top-stitched in our studio. Patchwork Table Runner measures 12"X72" made from vintage patches, Each with unique embroidery and pattern, Enhanced with multicoloured patchwork, glittering sequins and beadwork to give a look which is unique and supremely elegant. 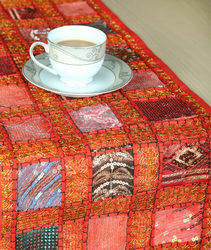 These exuberant colours of Barmeri patchwork are from Rajasthan, India. Lined in colour Red, the cotton runner is individually crafted. Thus colours and motifs can vary slightly. 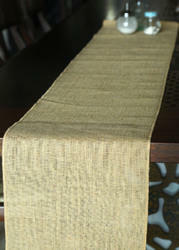 Jute Burlap table runner measures 12"X108" comes in a pack of 1. Made out of 100% natural jute. Serged edges for a clean finish. Ready to display for your big event. These Halloween Skull napkins make it easy to dress up your table setting for Halloween! 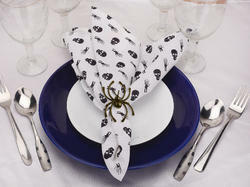 100% cotton printed napkins are elegant in their own way to transform your table for Halloween dinner parties. Comes in a set of 6 and measures 20""x20"". Our high-quality cloth napkin which are the perfect choice to use at Halloween mealtimes as well as other lunch parties. The classic skull printed napkins give a simple and elegant expression, which brings joy and horror to your dining table. Reusable napkins are not only sustainable but also will instantly enhance any tablescape. Description :Our charcoal black round placemats are made to compliment your everyday kitchen table, breakfast nook, and dinner table. Made of Cotton, these placemats give a luxurious outlook to your table. Whether you have a round glass dining table or a rattan one, these placemats go with every table. Braided by our skilled artisans, these placemats have such a construction that it is thick enough to provide the right amount of insulation and protection from spills and burns. 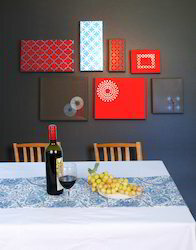 Each placemat measures 15 inches in diameters and comes in a set of 6. These placemats are designed in such a manner that it easily adds texture and interest to any table. High-Quality Cotton Table Cover. This is Attractive Floral Round Table Cover. Our table covers are the standard size compared to other sellers in the market. Go on and enjoy this beautifully created picnic mat. With its affordable rates and unique shopping experience, Rajrang is your one stop destination for making any given day an occasion. Usage:- Bed Cover, Tapestry, Picnic Mat, Curtain, Wall Hanging Or Table Cloth. High Quality Cotton Round Table Cover. 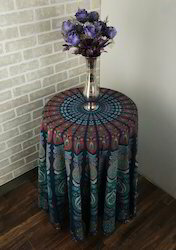 This is Attrative Floral Printed Table Cover. Our table cloth are the standard size compared to other sellers in the market. Material and print quality is the best available in the market. Go on and enjoy this beautifully created product. With its affordable rates and unique shopping experience, Rajrang is your one stop destination for making any given day an occasion. Make any table at home look elegant and modern with this handmade table cover. Inspired by the floral prints all over, the table runner saves the table top to get stained. The modern table runner that comes as an accessory to the table or buffet server. Made of cotton, the table runner is light in weight also. 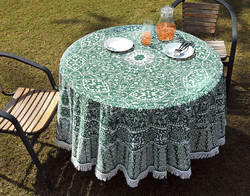 High-quality thick fabric that lays the table cloth flat and that does not slip on its own. Use these on festivals, social gatherings, weddings and other events. Serve the food with grace and style laying.